How long has it been? haha Over a year. This blog is like a wealthy aunt who you you only call upon when you need something. And that something is a space for documenting a potential craft fail. I’ve had four days off from work due to the 4th of July. Four days off in a row, where I don’t leave town, and I have absolute freedom to do whatever I want to do. God Bless America! So I decided to pull out my stash and the yarn sticks and attempt to knit a hat. As I made a glorious little hat, I realized how much I love to knit and how good I am at it. I’ve been failing miserably at sewing, wasting countless dollars and hours in Joann Fabrics when all this time, I could have been successfully adding cute knitwear to my collection. I can knit hats like a champ. I can fair isle like there is no tomorrow and I can intarsia like no one’s watching, but I have never made a sweater. So there it is. The GOAL: knit a (an easy) sweater. So I skipped over to Joann today (on day 3 of 4 days off), basket in hand and picked up a pile of Vanna’s Glamour Yarn and am ready to tackle a raglan sweater. I’ve tried this sweater before, long long ago but I think I can do it. It’s all knit flat and if I can work on a little bit each day I’m hoping to have a sweater before Labor Day! Maybe I’ll remember to recap on this blog about it or maybe in a year I’ll revisit this post and realize I never followed through, whatever the case may be, I promise to post a pic, good or bad of where the status of the sweater lies on Labor Day. 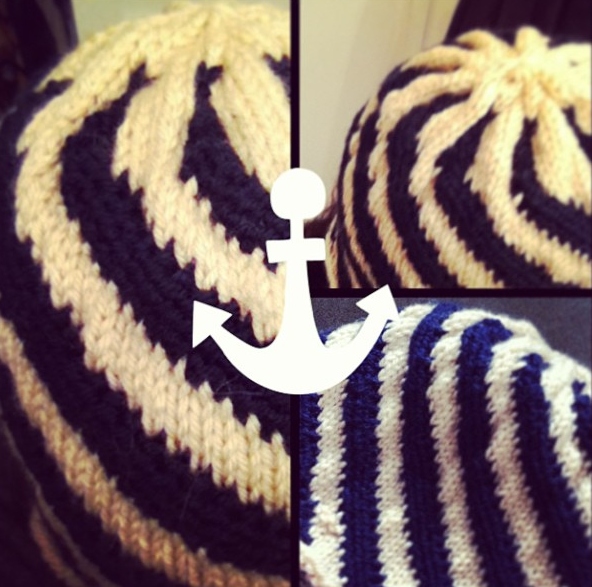 For now, enjoy the nautical hat I completed today. Sew, you think you can So! Patience, that will be the death of me. I have none when it comes to certain things. I do not like to wait for anyone or anything. I really want to be patient and sounds like St. Monica is the patron saint of patience. I’ll name my next cat Monica (boy or girl) if I can figure out this sewing thing. Plus, I can relate to Monica Gellar’s competitive and neurotic nature: Success! I’m trying to decide on a smart first attempt. I’ve read tons of blogs, yea, yea, light-weight cottons, I get it. eeek. Where are the chiffons and silks, pretty knits and flowy things! I hope this blog will slow me down and help me recognize my problem. I have a few books with patterns and I think it’s best to start there instead of spending more money when I have at least 10 patterns sitting in front of me. 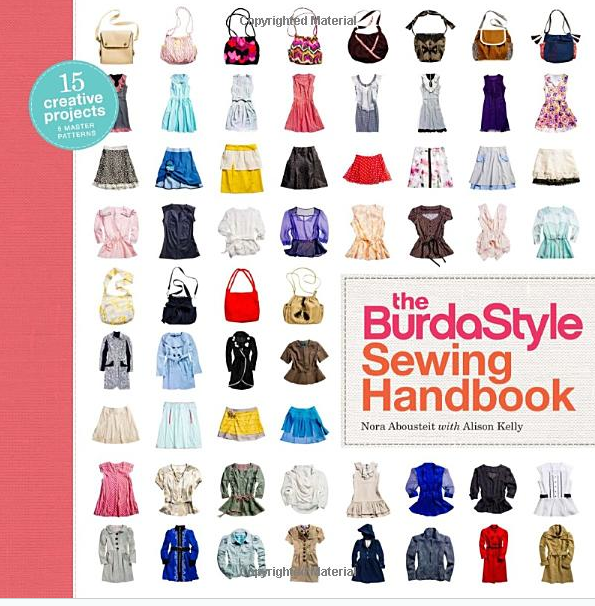 I have the BurdaStyle Sewing Handbook. I received this for my birthday about 6 months ago thinking it was the perfect beginner book. It is so NOT a beginner. It focuses on custom knit wear patterns, which I famously failed at with a beautiful navy blue knit fabric that was on clearance and probably the last of its kind on Earth. It’s a fun read but it has since been shelved and will remain there until further notice. And then there’s SEW Workshop. A lovely little book by Diana Rupp. She is so patient, she should change her name to Monica. I attempted four patterns in her book and three were a success. Although, the three winners were non-fashion accessories: a pin cushion, which took way longer than it should have, a zippered pencil case, which gave me the confidence to sew the wrap-skirt: MAJOR FAIL, which forced me to swallow my pride and sew the tote bag, which is cute but fits a slim folder. I have had my eye on a few of her patterns and I think I’ll start here. The great thing about this book is that she walks you through the patterns, which I find to be rare. I can knit like a crafty fool, but there are specific directions on how and what order to do things. Sewing patterns do not do this! That’s why I like Diana. I think I’ll start with her Cuddle Up Cardigan. The weather is starting to change and I want something I can wear in the next few weeks. It looks awfully big and I was thinking about making a miniature with some scrap footage to test out my skills before I go spend some money. There is no pattern but you make one. I have mad Illustrator skills and I think I can lay this out in 5 minutes between projects tomorrow and then attempt to scale it down and build a mini. hmmm. Who is the smart one? Stay tuned and I’ll try to take pictures of a master at work for all of you who are looking for a sewing mentor.